Published: June 16, 2008 at 11:29 a.m. The following story is from NFL.com's Fantasy Football 2008 Preview magazine, which is currently available on newsstands everywhere, as well as on NFLShop. If you thought the passing game went wild last year in the NFL, you were right. The 2007 season saw teams set records for the most passing attempts, completions, and yards since the league went to a 16-game schedule in 1978. But, thanks to a rule change championed by Titans head coach Jeff Fisher on the NFL Competition Committee, expect the monstrous passing numbers from last year to return to more normal levels in 2008. 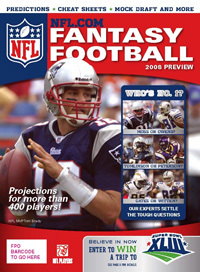 NFL.com's fantasy preview hits newsstands on June 16, but you can order your copy right now at NFL Shop. This season, defenses will be allowed to communicate from the sidelines to the field just as offenses can do. Until 15 seconds remain on the play clock, a defensive coordinator will be able to speak directly into the helmet of one of his players, allowing teams to audible out of bad coverages or poor matchups. The teams most negatively affected by this new rule will be those that use a no-huddle or quick-snap offense, or use a lot of audibles. That's not good news for past Super Bowl winners such as Tom Brady, Peyton Manning, and Ben Roethlisberger. (High-powered offenses like those in San Diego and Dallas that call most of their plays in the huddle will not be affected nearly as much.) As a result, I expect the overall passing game to recede this season, with a concurrent rise in overall running totals in 2008. That said, you can also expect more teams to install pieces of the college spread offense popularized in recent years by Wake Forest's innovative coach, Jim Grobe. Also, expect to see more teams incorporating forms of the zone-read offense that Vince Young ran so well when he won the national championship at Texas. It will help mobile QBs such as Young, JaMarcus Russell, and Jeff Garcia make quicker decisions on running or throwing. Here's a position-by-position look at things to keep in mind as you prepare for the 2008 fantasy season. From a fantasy standpoint last season, Brady took over the top role previously occupied by Peyton Manning. Brady will obviously be the first quarterback taken in most drafts this season and will probably go higher than all but a few elite-level RBs. Whether Tony Romo and Derek Anderson can dominate like they did at times last season is up for debate, but expect rebound fantasy performances from the likes of Donovan McNabb, Carson Palmer, and Marc Bulger. Position Strategy: Never wait too late to take your first QB or you could get stuck with a starter outside the top 15, leaving you to hope for some good luck on the free-agent wire in the first few weeks. Just because your top choices are gone, waiting until the 10th round to take your first QB doesn't bode well for success. Stay away from rookie QBs -- their fantasy value is nil. The running back position in fantasy has changed more than any other over the past decade. Gone are the days of Curtis Martin, Emmitt Smith, and Shaun Alexander getting 30 or more touches every week. In past seasons, fantasy players could count on at least a dozen top-notch RBs that could be expected to tote the rock that much. Now you'll be lucky to find three to five that even come close to those totals -- and good luck keeping them healthy with all that pounding. The best fantasy RBs are the ones who do as many of those things as possible. Even LaDainian Tomlinson took a step back last year in fantasy with the Chargers' increased use of Michael Turner and Darren Sproles. Steven Jackson and Larry Johnson missed a ton of games last year. Do-it-all backs such as Brian Westbrook seem to be a dying breed. 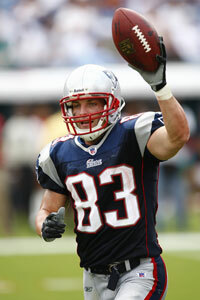 Wes Welker proved last year that the No. 2 WR on a team with a dominant No. 1 can still be lethal. Position Strategy: Identify the red-zone runner on each team. One good carry a week at the goal line might be worth more than the entire weekly production of a passing-down back. Don't be afraid to take a rookie runner, but don't count on him as one of your top two RBs. Let him play his way into a starting spot on your team when his weekly stats begin to warrant it. As Wes Welker showed last season with almost 1,200 yards and 8 touchdowns, the emergence of a secondary WR on an NFL team that already has a dominant WR can be lethal. Welker and T.J. Houshmandzadeh tied for the league lead with 112 catches last year. Ironically, neither of them is the "lead" receiver on his team. One wonders what kind of year Terry Glenn could have had for the Cowboys on the other side of Terrell Owens if he had been healthy. Keep this pattern in mind in 2008. You can thank Patriots head coach Bill Belichick for this trend. As defensive coaches plot to "eliminate" the top receiver from the offensive game plan, it opens up more opportunities for second, third, and fourth WRs -- but drives you nuts if you spent a second-round pick on Chad Johnson and he is "eliminated" by the defensive game plan 10 weeks out of 16. Position Strategy: As a general rule, stay away from the third and fourth WRs on teams that have elite pass-catching TEs (San Diego, Dallas, Cleveland, and Indy, to name a few). There are only so many balls to throw each week, and if your TE is getting 8 to 10 of them, it leaves everyone else to pick up scraps. Midseason fantasy trades can always nab you a top-12 to top-15 WR. Most fantasy owners deal from strength, and teams invariably end up with more quality WRs than they can start each week. Generally, a second- or third-tier RB can help you acquire a quality WR in trade. Last year, the NFL continued its trend toward spreading out defenses with pass-catching TEs who make linebackers look silly. That said, there are still barely a half-dozen TEs that really make a fantasy impact over the course of the year. Not to say you can't get lucky any given week with the likes of Heath Miller or Benjamin Watson, but getting one of the top TEs like Antonio Gates or Jason Witten puts you at a big advantage. Position Strategy: If you didn't get a good starter at TE in the draft and are playing roulette on the free-agent wire each week, look specifically at the injury report for which TEs are unavailable. Most teams use a couple of TEs; if one is gone, the other one has a greatly improved chance of getting involved in the offense that week. As a general rule, I tend to gravitate towards indoor and warm-weather kickers. However, last year's leading kicker in most leagues was Green Bay's Mason Crosby, who kicks in one of the coldest cities on the NFL landscape. Go figure! In fantasy leagues that don't force you to keep a backup at every position, don't bother. There will always be a quality supply of kickers available in free agency if you want to pick the best matchups or weather sites. Position Strategy: Take this as my annual reminder to never take ANY kicker early in ANY draft. There just isn't that much difference between the good kickers and the mediocre ones. Plus, figuring out before the season starts which kickers fit into which category is almost impossible. Save those kicker picks for the last round or two of your draft and use earlier picks to get offensive specialists that might really make an impact. Given the change in the defensive communication rule, defenses should be markedly improved this year from last season in terms of fantasy points. Expect more turnovers and more sacks from your team defenses. And to the delight of defensive coaches around the league, expect fewer defenses to be caught in the wrong coverage. That means not as many third-and-long situations, and it means the deep ball for a touchdown is a lot less likely because defenses will be able to get out of poor matchups via the helmet radio.